On 31 December 2013 I decided enough was enough. When I arrived in NZ nearly six years ago I had a 33″ waist and weighed around 90kg. Yet within five years I had reached 102kg – and the expensive jeans I had bought way back in 2009 would no longer do up. I mean, I couldn’t even get them over my thighs! In 2013 I went to the UK to celebrate my 30th birthday, and when I got home I saw the photos. Suffice it to say, I joined the gym straightaway. For once, I felt really motivated to lose some weight. And for the next six months I went to the gym at least three times a week – religiously! Alright, I didn’t exactly go nuts – I took a book with me – but it was more than I had been doing before (that is, nothing) and I thought my efforts would surely bear some fruit. I thought I would lose a kilo or two at least. Well, no! I didn’t lose a gram. Not a measly gram! I was exactly the same weight, just $300 worse off for membership fees. Then, while I was at work one day I happened to hear an interview on the radio with an Australian journalist called David Gillespie. He was plugging his new book Sweet Poison. My good friend Venessa saw how interested I was in what he had to say, so she very kindly bought me the book for Christmas. In the book Gillespie stresses the point that he is not a scientist and that Sweet Poison is not a diet book. He doesn’t advise his readers to eat just carrots, or just soup, or to cut out every conceivable form of carbohydrate. Gillespie simply researched sugar and its effects on the body. And he presents his findings in a very interesting and informative way, and in so doing casts considerable doubt on some of the longstanding beliefs about ‘good’ food and ‘bad’ food. For example, he raises this very interesting point: why is it that human beings in the Western World have got so much fatter over the past forty years, despite the fact that we now go to the gym more and consume more ‘low-fat’ products. OK, I concede that we now lead more sedentary lives. But you wouldn’t expect us to be so much bigger. Surely we should be, if not slimmer, at least the same size as our grandparents’ generation? Yet, the fact is the rate of morbid obesity is skyrocketing. Why is this? I won’t go into the whys and wherefores; Gillespie does this much more skillfully than I could. Instead, I will simply share with you my own personal experience. I think the facts (or kilos) speak for themselves. On New Year’s Eve I decided that from 1 January 2014 I would only consume food with a sugar content of less than 5 percent. I don’t know why I chose 5 percent; it just seemed like a good number. In one fell swoop I wiped chocolate (even dark chocolate contains 30% sugar), cookies, cake and lollies from my diet. Note: I had mentally prepared for this. What did surprise me, however, is the amount of food that contains more than 5 percent sugar that I had never even thought about. For example, even low-fat, ‘lite’ breakfast cereals, marketed as being healthy, contain 30% sugar. 30%! And those healthy yoghurts? Full of sugar! Overnight I started looking at the labels on the backs of packets. If the sugar content in the per 100g column was greater than 5, I simply wouldn’t eat it. That meant giving up tomato ketchup, most salad dressings, fruit juice, chutneys, and a lot more. It is really amazing how many products have a high sugar content. Not really. Yes, it took a bit of effort, but it certainly wasn’t difficult. In fact, I had expected it to be a lot harder. I used to eat a lot of chocolate, and I never turned down a piece of cake or a biscuit. Yet once I had resolved not to eat sugar, I found it was actually remarkably easy to do. That isn’t to say that I never think: “Wouldn’t it be nice to have a piece of cake?”, but I haven’t once hard a hard-out craving for something sweet. I actually find it hard to believe I have managed to go nearly 12 months without sugar or sweets. It really doesn’t feel like that long. Almost immediately I started to notice how much better I felt; and who cares whether it was psychosomatic or real? I had more energy, my bowel movements were a nutritionist’s dream, and, most importantly, the weight started to fall off! By the middle of the year, I was already down to around 94kg. I still went to the gym three times a week, and I still took my book with me. Basically, I didn’t change anything except cut out the sugar. I continued to eat hot chips, potato chips, real butter etc. And each month, when I had my weigh in, I was lighter. Now, for those of you who are screaming at me: “It’s not healthy to cut out a food group” or “You should eat everything in moderation”, I say to you, “I do.” I eat vegetables, whole fruit, bread, meat, fish, dairy, nuts, seeds, etc. I limit my caffeine intake and I take fish oil supplements every day. I actually eat very healthily. The only thing I do is limit my sugar consumption. And as for alcohol, I drink that too. Happy days! Thankfully, Gillespie explains why beer and wine is OK. Towards the end of October I reached by 90kg goal, and since then I have plateaued at about 90.5kg. I’m going to continue with my low sugar diet into the new year, mainly because it has been so easy, and the benefits have far outweighed (excuse the pun) any of the inconvenience. And, most importantly, I can now fit into my expensive jeans, and I can get the button done up! More happy days! 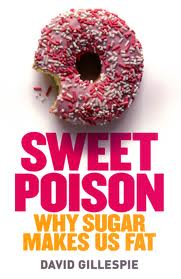 For those of you who are interested and want to know more, I recommend David Gillespie’s book Sweet Poison. Coming to a Kindle near you in August 2018! © 2018 Luke F Harris. All rights reserved.